A great white shark (great white shark) 2.7 meters long preyed upon by a mysterious creature that is greater according to the scientists. Creatures that prey on whether the great white shark is known malignant? Could Kraken?. A research team has put a tracker and detector on a great white shark that is healthy to track his movements as part of the study, but were surprised when the locator is stranded on a beach in Australia four months later. Data taken on the device indicates that the device (or the shark) has been dragged deep as 580 meters below the surface, and then all of a sudden rise in temperature to 78 ° F, or 32 ° F higher than normal body temperature of the great white shark. So this raises a reasonable question: what creatures that prey on the great white shark along the nearly three meters? The researchers believe that the data prove that sharks are eaten by something much bigger, because the temperature recorded showing the shark into the digestive systems of other animals. The case is described in detail in a documentary by the Smithsonian Institute titled Hunt for the Super Predator, which will be aired in the US on June 25. "When I was first told about the data taken from the equipment that used to exist in the shark, I was totally blown away," said filmmaker Dave Riggs in the documentary. "The question is not just come to my mind, but also the minds of all those involved is, 'what creatures eat it?" The shark is clearly prey. What predators that prey on large shark? What could kill the nine-foot long shark? " Conventional logic would suggest that it is an orca. Killer whale or Orca may devour these tools when the shark prey. They are usually quite large, can be two to three times the size of sharks and they have a documented history of a great white shark hunting. But the problem with this logic is that as far as we know, the killer whale never dive too deep; they usually stay near the surface, with their deepest dive recorded was 259 meters under controlled conditions. So if this indeed is the orca, we have a new record. Another theory is more plausible is that preyed upon by "the great white shark that is larger in size". 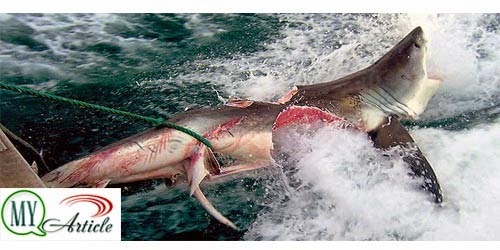 Cannibalism in shark is known to occur, ie the larger sharks prey on smaller sharks. A scientist claims even new research data fit with all the information from the devices installed on the shark was missing: the great white shark's body temperature the larger size the same as the temperature in the data tracking device, and the great white shark cannibals large (which they estimated length of 4.9m and weigh over two tons) could easily be dragged at the same speed velocity arrested on a tracking device.